A useful wooden bowl turned from a Cincinnati area tree can be a treasured gift to children graduating from college and starting a career, and to friends having to relocate out-or-town, out-of-state, or even overseas. The bowls all are turned from Cincinnati area branches or entire trees that had to be removed for one reason or another - insect damage, storm damage, leaning over a house, and so on. None were cut down simply to make bowls. They were turned by a Cincinnati native who has always had a respect and love of nature and the environment. Inventory is constantly changing as new bowls are turned and existing ones are sold. Bowls are generally available from ash, black walnut, bradford pear, cherry, and maple trees. Occasionally bowls are on hand from flame box elder, red oak, sycamore, and other woods as well. 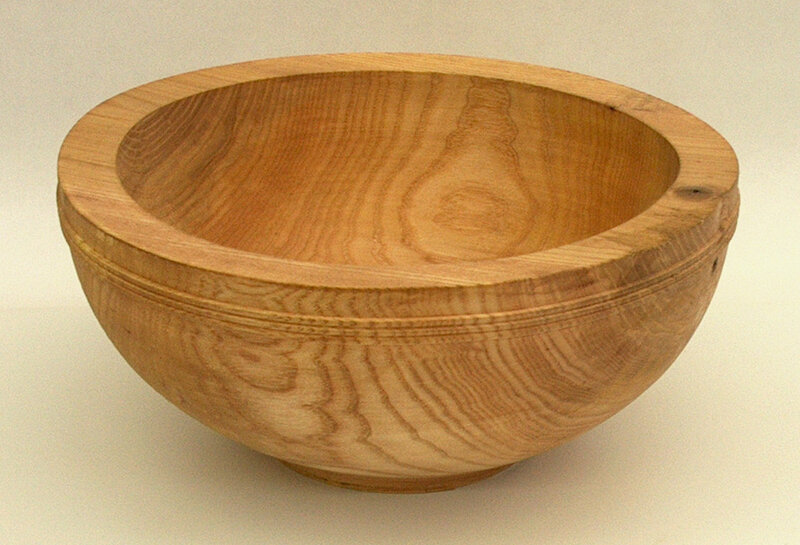 Many people think of wooden bowls for mixing baking ingredients, salads, displaying fruit, serving snacks, and other food uses. When not in use, though, these bowls often are in a cabinet. Smaller bowls are very handy for keeping grocery coupons, favorite recipe cards, tea bags, wrapped hard candy, car keys, and so much more. Used this way, the bowl is always close by to be used and enjoyed every day. In the above picture, from left to right the top row shows ash, maple, and another variety of ash; the middle row shows bradford pear and black walnut; the front row shows another black walnut, red oak, and sycamore. This picture shows a set of ash bowls made for a very good friend and his family. The tree died and was dropped on their property in the fall of 2013. The outer bowls in the back row are intended for their adult children living in Colorado and Florida as family keepsakes. The other five bowls are for the parents, for mixing and enjoying salads by themselves and when entertaining. Others have also had bowls made as family keepsakes for their children from lost trees under which the family spent time together. A locally made bowl from a local tree can be a great way to introduce a child or grandchild to the wonders of nature and inspire respect and admiration for the environment as well. Wooden bowls can have a wide variety of daily uses as well. In the above picture, for example, the large ash bowl in the upper left could hold fruit, the sycamore bowl in the middle could be used to mix dry ingredients, and the ash bowl in the upper right could be used to mix salads or serve chips to a group, while the two ash bowls in the front could be used for cereal and an individual salad. In this picture, the walnut, maple, and ash bowls across the back could be used for individual portion size snacks, the walnut bowl in front could be used for frequently worn jewelry and the ash bowl for the contents of a man's pockets overnight. The growth center of logs and branches is seldom incorporated in bowls because of its tendency to crack. In the bradford pear section on the left, the pith or growth center is also the geometric center of the log, giving more options for bowl blanks. In the elm section on the right, the pith is much closer to one edge, commonly seen in branches and leaning trees. The tree's growth rings create patterns on the inside and outside of bowls. With some woods, such as maple and bradford pear, the early season and late season woods are so similar in appearance that the growth rings are indistinct. At the other extreme, ash and oak have distinct differences in early season and late season wood, making the growth rings very noticeable. 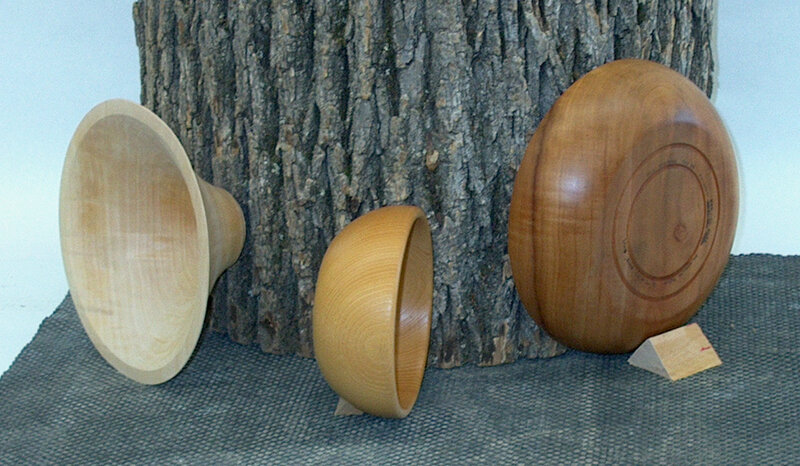 In this picture, the unfinished oak bowl on the left shows flat grain orientation, the bowl rim was facing the bark and the growth rings are parallel to the rim. The pattern created by growth rings is coincentric circles moving from the rim to the base of the bowl. The ash bowl on the right shows quartered grain orientation, the bowl was along a radius between the pith and bark, and the growth rings are perpendicular to the rim. The pattern in this bowl is parallel lines. This picture of the same two flared bowls shows that the grain patterns are the same inside the bowl. These two discs or sections are from black walnut on the left and elm on the right. What is very noticeable in both is a lighter band of wood just under the bark, the sapwood, and darker wood within, the heartwood. Trees use the wood inside the bark to move moisture between the roots and the leaves. As trees get larger they do not need all of this moisture carrying capacity, and the oldest wood dies. The living wood still carrying moisture is called sapwood and the dead wood is heartwood. Not all trees have such noticeably differently colored sapwood and heartwood. Bowls turned from wood with noticeably different sapwood and heartwood can incorporate the color difference in interesting ways. Some species of tree sometimes have color variation often called mineral stains not linked to sapwood and heartwood. The common explanation is that minerals dissolved in ground water are taken up by the tree's roots, and the minerals left in the wood. The ash bowl on the left shows just a bit of mineral stain in the heartwood at the back of the bowl, there is almost none in the sapwood. The right ash bowl shows extensive mineral stains creating wonderful swirling lighter and darker hues. In lumber, mineral stains can be undesirable when multiple boards from multiple trees are combined into a piece of furniture. There can be a surprising difference in appearance between species of the same tree genus. The above picture shows two different species of ash that grew in Cincinnati. The one on the left had a narrower band of sapwood, and the wood was slightly whiter and coarser than the one on the right. Almost immediately a cut log or branch develops shrinkage cracks, and cracked wood can come apart catastrophically as it spins at high RPM's on the lathe. To turn bowls before the green wood begins shrinking and cracking, the cut ends can be sealed with paint, glue, or wax - shrinkage cracks can begin in the log ends within a couple hours of the tree being cut. With the ends sealed, the wood can be set aside for a few days or even a few months, depending on the time of year and whether the tree was still living or recently dead. A two inch diameter circle has been drawn around the pith of these three pieces of ash log. As mentioned earlier, the pith is highly prone to cracking and generally is not incorporated in bowls. Bowls can be more visually pleasing when centered on a cross section of the growth rings. The bowl outline in the upper left area of the first piece of ash has the growth rings running evenly through the outline. A second shallow bowl has been outlined on the right side of this piece of ash. The remainder does not allow a synmmetric pattern of growth rings and would be discarded. The first, red line drawn on the end of the middle piece of wood was not symmetric on the growth rings and was crossed out. A dashed line was drawn to help visualize placement of the bowl outlines and the top and bottom of this piece of wood. Marking out on the right piece of ash began with a flared bowl outline symmetric to the growth rings. Three additional outlines were then drawn to make the most use of the wood. It is worth noting that the growth center or pith is not the geometric center of any of these pieces of wood, which complicates marking out bowls. This picture is using smaller pieces of ash. Because the pith was close to one edge, only one bowl was outlined. The wood was was cut in two, and the right piece will be used for a bowl. A circle marking the bowl blank was drawn in red on the outside of the piece. The middle part of the picture shows a similar piece that has had the four corners removed to make the rough blank more round. On the right, a third piece was mounted on a screw chuck, put on the lathe, and the bark and surface defects removed, leaving a fully roughed out bowl blank. For safety, the tail stock is brought up against the rough blank until it is fully round. The bump is where the tail stock was contacting the blank. At the left is shown the screw chuck often used to mount small to medium sized bowl blanks on the lathe. At the right is a faceplate used to mount large and heavy bowl blanks safely. The middle two items are the the finished outsides of ash blanks shown in the prior picture. At the top of each of the blanks is a tenon that will be used to hold the bowl so that the inside can be shaped. This picture shows the two bowls after the insides have been finished. The flared bowl is mounted in a four jaw chuck grasping the tenon. At the right is another four jaw chuck with larger jaws, used to hold much larger bowl blanks. The two approaches to bowls from green wood are known as "once turned" and "twice turned." The bowls in the above picture are "once turned." All shaping of once turned bowls is completed while the blank is on the lathe. This includes all turned design and decorative details, and the wood is still wet when this turning is finished. As wood dries it shrinks. If allowed to dry rapidly, many of these once turned bowls would crack. There are different methodologies used by different turners to try to remove the remaining moisture from the bowl without cracking. I place the just turned bowls in paper bags on a concrete floor. 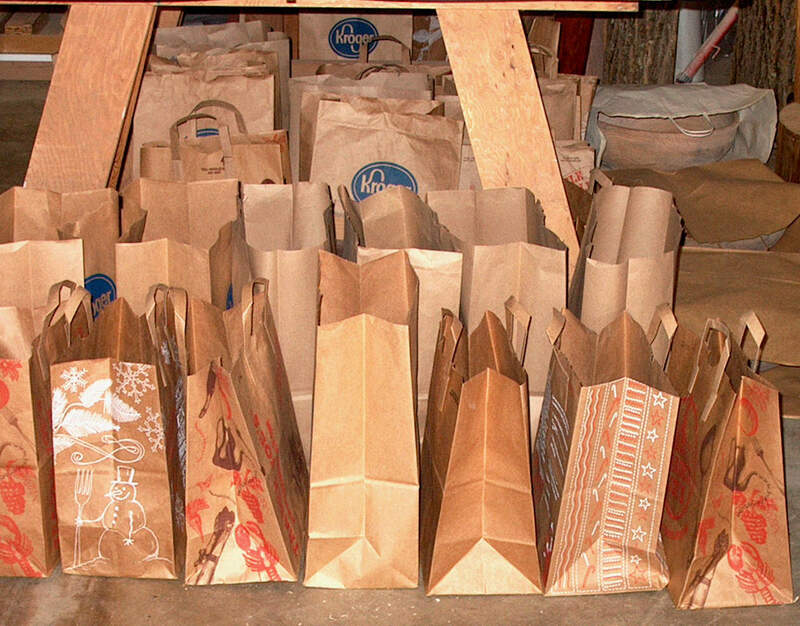 The paper bag slows the rate of drying, and a concrete floor usually is an area of higher himidity than on a table or shelf. The bowls are weighed to the nearest gram every few days, and are returned to the floor until the weight loss is less than 2%. The bowls and bags are then placed on a table or shelf off the concrete floor until the loss between weighings is again less than 2%. At that time the bowls are removed from the bags, and when the bowls are no longer losing weight they are dry enough to sand and receive finish. Controlled slow drying allows the wood to "twist and turn" in response to shrinkage, rather than cracking. Some species of wood move more than others during drying, but many develop charming irregular twists and bends that emphasize the natural origins of wood. Some people prefer a perfectly symmetric bowl, one without any twisting or warping. That requires first rough turning a bowl with thicker walls. The guideline is to leave the wall thickness 10% of the bowl diameter, so for example a 12" diameter bowl would be left with walls 1" thick. Many turners paint the rough turned bowl with latex paint or wax, or use some other method to try to keep the rough bowl from cracking. After four to twenty-four months the rough bowl is dry. It has warped as it dried, but after re-mounting on the lathe the rough bowl is turned round and then a final shape developed. Such a twice turned bowl will remain perfectly round for life, because it was completely dry when finish turned. After some early experimentation, the preferred finish became an oil-varnish blend, what is generically known as a danish oil. The linseed oil component warms the wood beautifully, and the alkyd varnish component provides water and stain protection. Three hand rubbed coats are applied, with light sanding between coats. The result is a satin sheen that invites handling and use. Although offering protection against water and stains, the finish is thin, so that the tactile feedback of wood's texture is still enjoyable. After a year's use for a daily breakfast of corn flakes and milk, an ash bowl showed no damage, other than some loss of color. Each morning it was washed with a kitchen sponge and dishwashing soap, towel dried and placed back on the shelf. It is pictured above and the bowl is expected to stand up as is for additional years. When another coat of oil-varnish blend is desired, it is simply a matter of cleaning the surface well, wiping on another coat and allowing it to cure for up to 48 hours. Some bowls have a delicate nature or pierced side and are best admired on a shelf. 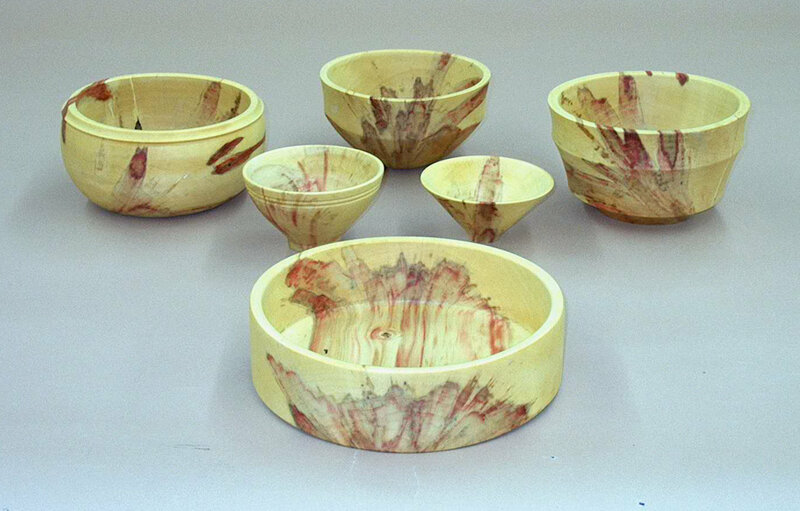 Examples would be burl, a bowl with open knotholes, or one with a bark rim. In the above picture, the left bowl is made from walnut burl with some voids and included bark. The right black walnut bowl has some bark in two spots along the rim. Most of these bowls can be both admired and used to mix salad or baking ingredients; offer candy; share chips and popcorn; add enjoyment to breakfast cereal; and more. From left to right, the back row shows what is commonly used as a salad mixing bowl, a general mixing bowl, and a fruit or display bowl, all of which happen to be ash. The middle row shows what could be a sycamore chips and popcorn bowl on the left and a black walnut cereal bowl on the right. Finally, the front bradford pear bowl could be used to present candy to office and home visitors and guests. Of course, all of the bowls can be equally well applied to other uses. Box elder is an opportunistic tree that can quickly get started on lowlands and recently disturbed ground. Interestingly, it is the only tree in the maple family with a compound leaf. Box elder is not well tolerated in urban areas because its branches tend to break in storms, and its leaves are some of the earliest to turn brown and begin falling. Normally the wood is very light colored with indistinct growth ring patterns. Occasionally, however, the wood contains amazing red swirls radiating out from the center of the tree. Once thought to be caused by a fungus, a recent rigorous study suggested the red pigment is created by the tree as a result of injury. Unfortunately, the sometimes dramatic red patterns fade to brown in time with exposure to bright light. An available handout provides some more information on box elder and this phenomenon.